Trophies is 16 tracks of mass appeal set in motion by two different eras of hip hop's elite. 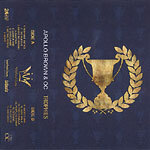 Detroit producer Apollo Brown lays the foundation, and the legendary OC constructs the vocals. Trophies is straight to the point hip hop; no frills, no preservatives, not even a single feature. Just OC at his finest and Apollo once again commanding no disappointments.